Tattoos. They are quite popular in our culture. Indeed, as is evident in the image above, some of my co-workers have them. Some, like the one above, are quite awesome in terms of artistry. Others are sometimes downright dismal and ugly. Some of that is due to the skill of the artist doing the tattoo. Some of that is due to the individual, their choice of design, and the physical condition of their skin. Saggy skin, it would seem, is more difficult to tattoo than skin that is reasonably taunt. Truthfully, I don’t understand it at all. 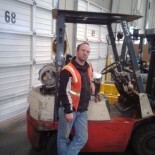 Then again, I drive forklift. Facebook is quite popular. Indeed, I have made mention of it in previous posts. One of the interesting aspects of social media is how an idea, good or bad, can be rapidly spread about the internet. Sadly, many ideas are being spread that often lack any good judgment or serious research. Below are two conflicting concepts regarding tattoos and salvation (or the church). Both of these pictures same two common themes, tattoos and the church. In the top one, there is an image of two arms. One has tattoos and the other doesn’t. The picture claims these are the arms of two people who died in a crash. The one with no tattoos was sinless and clean, so they went to Heaven. 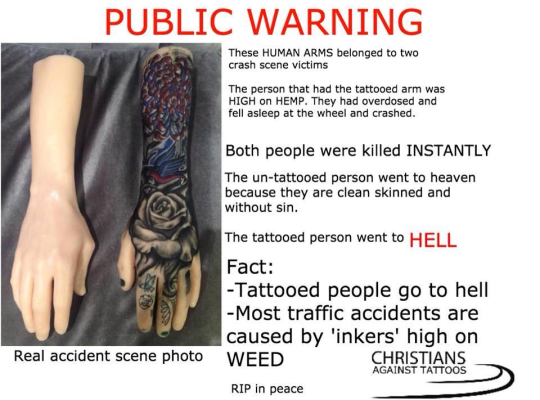 The other, because of their tattoos, was sent straight to Hell. HOGWASH! It is only by what Christ Jesus has done upon the cross that our sins can be forgiven. None of us, in and of ourselves, is sinless. We are all sinners. To have or not have a tattoo does NOT make you more or less of a sinner than somebody else. The bottom picture is almost as bad. I admit, I know a good many people with tattoos who are the best possible friends a guy could want (and I do number a few of them as my best friends). However, the second half of the claim regarding the most judgment people being the ones who go to church every Sunday, well let the pot call the kettle black. Yep. Hypocrisy. Yes, there are hypocrites in the church, and there is always room for another. However, it is quite judgmental to say that those who are most judgmental are the ones who go to church. This is also sinful, as you are now bearing false witness against both yourself and your neighbor. However, I can’t say I’m surprised by this. Now it is common knowledge that there is a verse in the Bible regarding tattoos. Oddly, it is the only verse of its kind anywhere in the Bible, this being despite numerous other verses regarding marks. This singular verse in found in the nineteenth chapter of Leviticus. The verse, which has no additional context, is thus: “You shall not make any cuts on your body for the dead or tattoo yourselves: I am the Lord.” Oddly, this verse is found in the context of other instructions, including not wearing garments made of two different materials, or sowing two different seeds types in the same field. Here is the interesting thing about this. All of this falls under what is known as the ceremonial law. I know that may sound a little strange, especially if your church doesn’t discuss this concept. In a nutshell, the ceremonial law is what defined the people of Israel, that is it defined how they dressed, ate, what they wore, and how they worshipped. All of this was to set them apart as the chosen people by whom the messiah (Christ Jesus) would come and fulfill all that Moses and the prophets had written. Christ Jesus fulfilled the ceremonial law and all its ordinances by living a sinless life, dying upon the cross for our sins, being buried, and rising again. Thus, being fulfilled, the ceremonial law is no longer applicable. However, the moral law still is applicable. To that end, there are things found in both the ceremonial and moral law that are still considered sinful. We might not stone one to death for transgressing it, but the thing is still sinful. Tattoos do NOT fall into this category of moral law. Is it sinful to have a tattoo? I don’t think so. However, on the historical side of the house, let us consider what tattoos were often meant for. According to the Smithsonian, tattooing goes back quite a few milleniums. Tattoos were used for various purposes. Some of them were to mark slaves (or cattle) as the property of a certain person (thus that person’s mark). Sometimes they were used to denote a certain vow. In at least once case, Egypt, tattoos were primarily for women, and in one particular case, a certain high priestess named Amunet. In more recent history, tattoos are known to have been inscribed upon POW’s of various nations during many of the wars that have gone on throughout history. Indeed, it was a common practice of the Nazi party to tattoo the Jewish people they arrested. Part of this was actually because the Nazis were aware of what was written in Leviticus 19, which really makes no distinction regarding who puts a tattoo upon a person. Oh, did you by chance notice what the explicit purpose of no tattoos or cuttings was? It was with regards to the dead. Yes, that law was with regards to markings for the dead, and the Nazis knew it. Tattoos certainly have an interesting, and sometimes twisted, history. However, to get one is no more sinful than it is to eat bacon and ham sandwich with a side of crab legs (eating pig flesh of any sort or crab meat was a violation of the ceremonial law). Do I have any tattoos? I admit that I spent five years of my life in the US Navy, yet I do not have a single tattoo anywhere. WHAT?? How?? Simple, I’m afraid of needles. There has never been, and doubtful that there ever will be, a design that I like so much that I am willing to endure needles being rapidly poked into my skin, injecting a permanent dye, and placing a mark upon my body. Don’t get me wrong, I like tattoos, I am just too much of a wimp to get one. I think that having a tattoo isn’t a sin. I think the real sin comes from having a judgmental attitude, regardless of whether or not you like tattoos. However, the only truly unforgiven sin is that of being unrepentant. 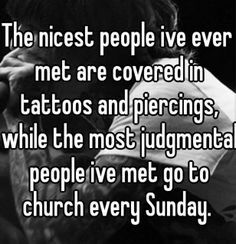 Truthfully, I know many good Christians who attend church regularly and some even have some pretty awesome looking tattoos as well. Me? I’ll stick with ham radio. OINK! Note: I am not an expert on Moral Law vs. Ceremonial Law. Here is a video that explains the concept better than I can. I thank the guys at Lutheran Satire for this. 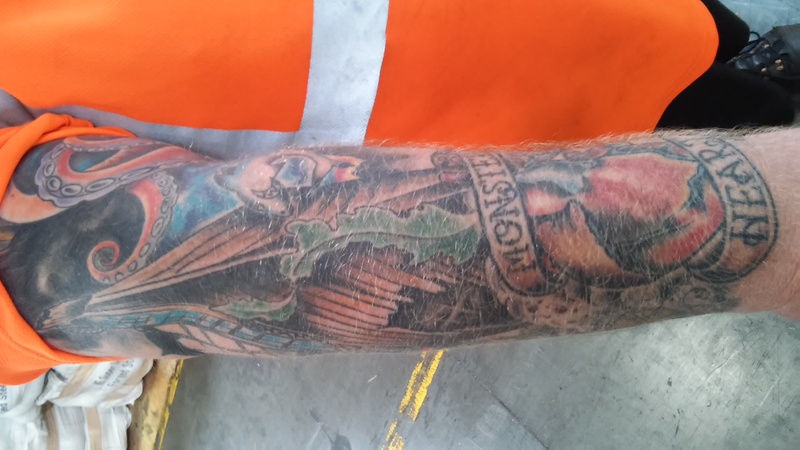 Also, special thanks to my co-worker, Dave Jones, for the use of his epic tattoo for this blog, yes, the picture at the very top of this post. I really do love the work done by the guys at Lutheran Satire. This entry was posted on 19/07/2015 by Christopher Rose in Ceremonial and Moral Law, Discernment, Law and Gospel and tagged Amunet, ceremonial law, Christ Jesus, Church, Hypocrisy, Judgment, Lutheran Satire, Mark, moral law, Moses, Salvation, Sin, tattoos.